Healthy (unsaturated) fats, in moderation, from nuts, olive oil, and other plant-based oils, avocado, and fish, are good for our health. They help the body absorb fat-soluble vitamins in foods and make you feel fuller longer. What we shouldn’t eat is also simple: sugary beverages (sodas and energy drinks) and trans fats; too much red meat, cheese, and other forms of saturated fat; and refined carbohydrates, such as white bread, white rice, sweetened cereals, and pastries. For decades, Americans were led to believe that fat was the villain. “We went off the track when we started focusing on low-fat, high-carbohydrate foods, and we loaded up on starch and sugar,” says Dr. Walter Willett, professor of epidemiology and nutrition at Harvard T.H. Chan School of Public Health. Most experts believe this is what caused the surge in obesity, diabetes, and cardiovascular disease. Healthy (unsaturated) fats, in moderation, from nuts, olive oil, and other plant-based oils, avocado, and fish, are good for our health. They help the body absorb fat-soluble vitamins in foods and make you feel fuller longer. Dr. Fatima Cody Stanford, Obesity Medicine Physician at Massachusetts General Hospital, says we shouldn’t overlook frozen vegetables. “They’re flash-frozen at their peak and you don’t have to worry about them going bad,” she says. “Frozen vegetables are very economical.” Use them on their own or in soups, pasta, and grain dishes, and casseroles. Eat a variety of fruits, but limit fruit juice. “Eating an apple provides satiety, fiber, and a sustained release of carbs,” says Willett, compared to gulping down a glass of apple juice, which contains more sugar. For protein, Willett advises eating fish a few times a week — mackerel, rainbow trout, sardines, oysters, canned tuna, and salmon are rich sources of omega-3 fatty acids — and lean poultry once or twice a week. Limit red meat to only a few times a month and/or use meat as if it were a seasoning, in small amounts to flavor a dish of vegetables or grains. Consume milk and cheese in modest amounts, he says, adding that plain (unsweetened) yogurt is the best way to get dairy. If buying fresh fish is a budget buster, opt for canned salmon. “It’s one of the best bargains, with more omega-3 per dollar,” says Willett. Use it to make salmon patties or, like canned tuna (also a good value), in salads. Look for deals in the frozen-fish case and try small fresh fish, such as sardines and smelts, which are inexpensive and good for you. Willett is a big fan of nuts, recommending we eat a variety of these powerhouses. In addition to eating them as a snack as is (in moderation), try them ground up in nut and bean burgers, make pesto from blanched greens, herbs, nuts, and olive oil, and add nuts to vegetables and grain dishes. Legumes are another healthy plant protein, including beans, soybeans, peas, chickpeas, and lentils. While canned beans are fine, try cooking a pound of dried beans every Sunday, then use them during the week in bean stews, chili, grain bowls, enchiladas, dips, and salads. Eggs aren’t specifically mentioned on the Healthy Eating Plate, but current science acknowledges that, in moderation, eggs are a good source of inexpensive protein and important nutrients. Willett explains that eggs for breakfast are better than a lot of refined starch and sugar or bacon and sausage, but in comparison, a bowl of oatmeal or other whole grains and nuts or plain yogurt with fruit offers protein and other positive health benefits. Carbohydrates may be the most confusing food category. Good (or complex) carbs, such as whole grains, vegetables, fruits, and beans, contain nutrients and fiber. The “bad” kind are processed, refined carbs, with much of the fiber and nutrients removed. Whole grains have the bran, germ, and endosperm of the kernels intact. Try any and all of the following: wheat berries, rye berries, spelt, kamut, freekah, farro, bulgur, buckwheat, oats, quinoa, barley, and brown rice. A healthy meal ends up looking very much like the Mediterranean way of eating, which has been the gold standard. 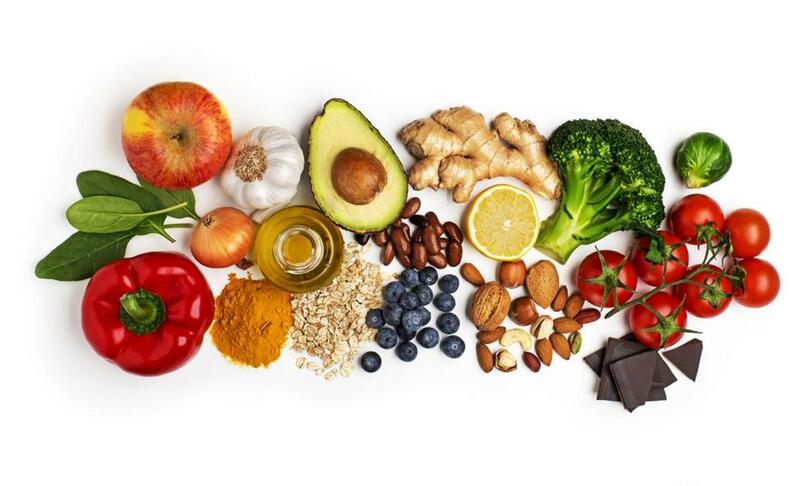 The “Mediterranean diet” emphasizes plant-based foods, including vegetables, fruits, whole grains, legumes, and nuts; eating fish and lean poultry and minimal red meat; and using healthy fats such as olive oil instead of butter. If you have the time and wherewithal to cook, do it. That way, you’ll know exactly what you’re eating. Look for recipes in cookbooks or watch a few cooking videos to learn basic dishes and techniques. Stock the fridge with fresh vegetables and fruits, whole wheat bread, and plain yogurt and the freezer with frozen veggies and fruits and extra supplies of nuts. Stock your pantry with (canned and dried) beans, nuts, canned fish, whole grains, whole wheat pasta, and canned tomatoes. Partially prepped ingredients, prepared foods, and frozen meals are useful time-savers, but watch out for chemical-sounding ingredients and excess added sugar and sodium. And don’t forget to make your food taste good, says Stanford of MGH. She recommends her patients have a generous hand with spices, particularly low-salt mixes, such as Trader Joe’s 21 Seasoning Salute, Chef Paul Prudhomme’s seafood magic, Italian herb mixes, and Caribbean Jerk seasoning.